The European transport market remained completely unaffected by international trade conflicts and pessimistic economic forecasts in the final quarter of 2018. “The transport industry experienced a traditionally strong final quarter,” said TIMOCOM company spokesman Gunnar Gburek, commenting on the current transport barometer numbers. 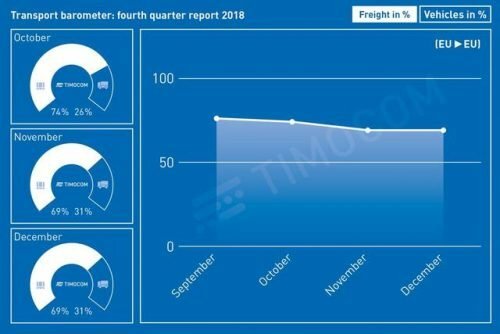 The transport barometer is used by the IT company to analyse, per quarter, trends in transport offers and demand as found on the freight exchange that is part of the TIMOCOM Smart Logistics System. With 127,000 users and up to 750,000 international freight and vehicle offers daily, it is the largest freight exchange for road transportation of goods in Europe. A look at the analysis of the fourth quarter shows that demand from companies offering freight for the transport market via TIMOCOM exceeded the amount of available vehicle space on offer by more than two thirds. On average, from October to December 2018, there were 71 freight offers for every 29 vehicle offers. The result confirms that the current imbalance between high amounts of freight and available vehicle capacities remains unchanged on the transport market. “Transport prices will remain under pressure in 2019, as transport capacity remains scarce,” Gburek predicts. He says there is no end in sight: the number of HGV drivers in Germany will only get lower, becoming an even greater regulating factor when it comes to economic growth. Drivers say! Queen Bohemian Rhapsody is top of the list!